One afternoon recently, I had the pleasure of spending a hour or so along the banks of the Middle River that runs near my home, through Augusta County in Virginia. This time of year it was just exploding with all the beauty and possibilities of Spring. It was so soothing to walk along the dirt road that follows the path of the river and hear the water running over the rocks. While the views of the river are lovely, I am more drawn to the small details along the way. The bank along this particular stretch of the river was awash in wildflowers just making their appearance for this year. Many of the wildflowers were ones that I was not familiar with because they don’t grow in New York state where I lived for so long. I’m looking forward to revisiting this spot many times during the year to see how it changes. The Middle River, near Verona, VA. 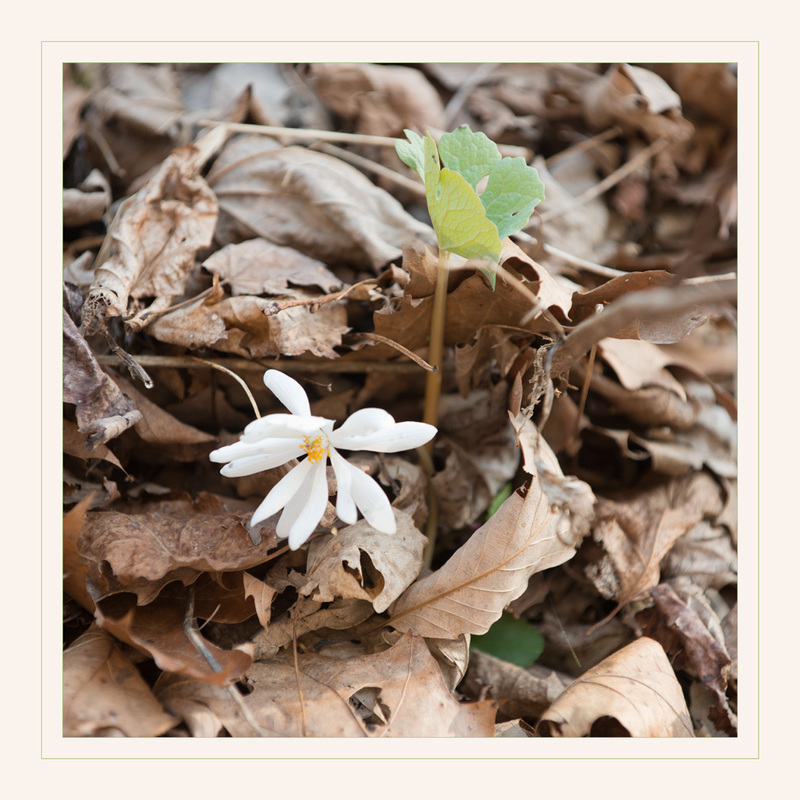 The first Bloodroot flower I’ve ever seen. I loved the way these tree roots framed another Bloodroot plant. The flowers really do look like little pairs of pants on this Dutchman’s Breeches plant. Cutleaf Toothwort gets its name from it’s historical use to treat toothaches. Virginia Spring Beauty is most aptly named. It was too early in the bloom for me to know what this shrub is but I loved the airy patterns that the branches created in the afternoon sunlight. This entry was posted in Filling the Well, Sharing and tagged Flowers, Nature on April 21, 2018 by gail. We got out for our first hike of the year the other day. It was just a short bit of a hike since the water in the stream was too high to cross that day. It looks like a hike that would be fun to do several times throughout the season as there are huge groups of mountain laurel as well as rhododendrons, and who knows what else?! And if you can cross the stream and go further there is a waterfall to enjoy. Hiking in Virginia in late March was such a delight. We are used to Mud season in NY’s Adirondacks that makes hiking a challenge in the spring time. Here are just a few glimpses of a lovely time in the woods. 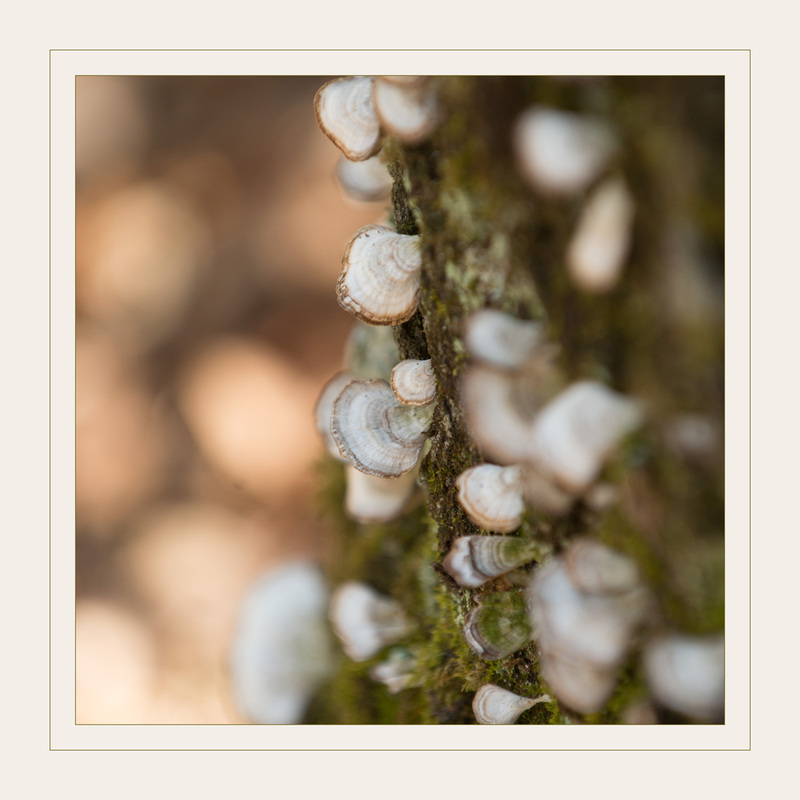 This entry was posted in Filling the Well, Open to Delight and tagged Nature, Trees, Water on April 2, 2018 by gail. A couple of weeks ago, in the post Out There, I shared some images that I had submitted to a call for entry at the A Smith Gallery with the theme, Vistas. Yesterday, the juror’s choices were announced and I was pleased to have the image, The View from Shore #10, accepted for the exhibit. On exhibit at A Smith Gallery, Johnson City, TX, November 3 to December 17, 2017. Dan Burkholder was the juror for this exhibit. As I mentioned in the earlier post, each call for entry has a different juror. While each juror is very capable and accomplished, they too have personal preferences. It’s fun to see what sort of images are accepted. Was this one of your choices? You can view all the images that were accepted here in this online gallery (click on the images to advance through the entire exhibit). Of course, if you happen to be in the Johnson City area in November, stop in and check it out in person. It’s a great gallery. Now I need to get a print sent to the gallery! This entry was posted in Filling the Well, Stretching and tagged Adirondacks, Fall Colors, Inspiration, Long Exposure on October 4, 2017 by gail. One of the things I do as a fine art photographer is submit images to “calls for entry”. I call it getting my work “out there”. There are many organizations nationally and internationally that publish these calls to invite artists to submit work. Over the past few years, I’ve found a few specific galleries where my work seems to generally fit and I like the way the gallery is run. They have various exhibits throughout the year, usually with some theme. If I have images that I feel fit a certain theme, I will submit to that call for entry. Entering images provides me with another outlet for my work, a way to have BNF’s (big names in the field) see my work, and to receive some feedback on it, even if that feedback is simply being accepted or not. Having work accepted for an exhibit helps me to build a resume that shows my work has been exhibited at the national level. And it’s just fun! These two images were exhibited at the A Smith Gallery this year as part of two different shows. Each show at this gallery, as well as many others I submit to, has a different juror for each show, those BNF’s I mentioned earlier. Impressions of Trees-5 was accepted into the Trees exhibit at the A Smith Gallery in Johnson City , Texas in January. Between the Mountains and the Sea was accepted to the Elsewhere exhibit at the A Smith Gallery in Johnson City Texas in the spring. Do you think any of these will be accepted? If so, which ones? I’ll let you know when I find out. View from Shore #10 On exhibit at A Smith Gallery, Johnson City, TX, November 3 to December 17, 2017. This entry was posted in Filling the Well, Sharing and tagged Creativity, Inspiration on September 17, 2017 by gail. In January of this year I was introduced to photo encaustic work. I immediately knew that this was a new direction that I wanted to pursue with my work. Encaustic painting uses beeswax and pigments and is a very ancient medium. Photo encaustics, combines photography with the warm beeswax medium creating very unique, layered, moody images. In July, I was able to attend a 3 day workshop at R & F Handmade Paints to learn and try working with photo encaustics. I came away with a strong (that’s putting it mildly) desire to continue to continue to learn and work with encaustics and my photography. Encaustics provides a more hands on way of working with my images, something I have been craving for some time. While I enjoy computer work at times, I wanted to create more hand made pieces. It also gives an extra dimension to the images with all the layers of wax and pigments. I have plans to set up a dedicated encaustic studio where I can continue to explore this fascinating medium. I’ll keep you posted as that progresses. For now, here are a few images of me at the workshop and some of my practice pieces. I have much, much more to learn!!! This entry was posted in Filling the Well, Practicing, Stretching and tagged Creativity, Inspiration on August 27, 2017 by gail. A couple of weekends ago, I got to spend some wonderful time with six other photographers, leading another Seeing with New Eyes Beginners’ Photography Retreat at New Skete Monastery. Despite torrential rains, 65 mph winds, and a brief power outage we enjoyed this wonderful setting that is so rich in images. Actually some of those conditions created some unique images. No matter where you are or what the conditions there is always something to be seen, to be noticed. Spring had just arrived on the mountain that holds New Skete Monastery and the earth was waking up from it’s hibernation. New life, potential, and hope surrounded us. We spent a lot of time going over the basics of how photography and our cameras work. When you know how they work, you can make decisions about what type of image you want to create rather than letting the camera decide for you. Understanding the basics allows a photographer to create images with intention. If you are interested in a future photography retreat, sign up for my newsletter and you’ll be the first to know. This entry was posted in Filling the Well, Seeing and tagged Inspiration, Learning, Nature, Retreats on May 18, 2017 by gail. This Gaelic blessing has been going through my head lately, in a time when there seems to be little peace. I’ve been focusing on the good, the light, the peace that does exist to calm my thoughts. Also, my mind has been going back to New Skete Monastery where I held the Seeing with New Eyes photography retreats last year. It’s been going there because it is a place of peace and also because we have just scheduled another retreat there for next May. So for today, I share some peaceful images from my time at New Skete and the hope for deep peace. This entry was posted in Filling the Well and tagged Retreats on November 16, 2016 by gail. Fall is currently putting on a spectacular show in upstate NY. We’ve had warm sunny days and incredible colors. The only thing that is not good about Fall is the long winter that comes after. We went on a little adventure to savor these amazing days and took a drive on the Powley-Piseco Rd. in Fulton County, NY. It’s in the southern portion of the Adirondack Park. If you live in the area and have an opportunity, I highly (Haile, get it?) recommend exploring this bit of paradise. Here’s a few of my favorites from our day. This entry was posted in Filling the Well, Seeing and tagged Adirondacks, Creativity, Fall, Inspiration, Nature, Trees on October 19, 2016 by gail. I spent 3 wonderful days last week in Rockport, MA on a little retreat. Rockport is a small, very old and historic port north of Boston. Anywhere near the ocean is heaven for me and three days with only myself and my own thoughts was an added treat. I made lots of images, spent masses of time on a rocky, shallow beach that begs to be explored for hours at low tide, played with images of the bobbing dinghys in the harbor, played with my Lensbaby, but the most satisfying images were made in the last hour I was there. The tiny cottage where I stayed had a spiral staircase and a string of driftwood pieces hanging along side it. Just before I was to leave, I noticed some interesting light and all the lines that were being created in that spot. Packing stopped and I spent more than 30 minutes making images of the lines and light. Of a week filled with things I love, for some reason this slice of time was extremely gratifying. Perhaps because I had spent a few days exhaling and relaxing, I was more able to notice and appreciate this little scene of quiet wonder. But, noticing these small things is what fills our days with delight and gratitude. It was a reminder to me (because we all need frequent reminding) to stop often and appreciate what is right under my nose. This entry was posted in Filling the Well, Open to Delight, Seeing and tagged Delight, Inspiration, Love to travel, Play on October 11, 2016 by gail. It’s really good for us to be a rookie, a beginner, sometimes. I so enjoy my level of competence with photography but also love to challenge myself to learn new skills that have the potential to push me and my work a bit further. I’ve been feeling like a total rookie lately. I’ve been transported back to my early days of learning this craft, feeling like I don’t understand how my camera is working and how to control it, looking at my images and seeing more duds than successes. What has caused all this? The Lensbaby! A Lensbaby is a specialized lens that, in the right hands, creates very dreamy images, which you know I love. Heck, their motto is “see in a new way.” Of course I’d want a piece of that! I bought one of the early versions (on the left below) several years ago and could not master it. To be fair to me, it was basically a lens on a squishy tube that you had to squeeze, bend, hold, and focus to get an image. Just couldn’t get the hang of it. But I still really admired the look of Lensbaby images that I saw. Then a few years ago they came out with a more advanced version of the lens (on the right below). It no longer had a squishy tube, but rather was on a ball that you could rotate and the lens would stay where you bent it. Yay! I thought this would be so much better and I’d have these wonderful images with soft, blurred edges and a sharp area of focus where ever I decided to put it. But I still just couldn’t get the hang of it. It hung out in my camera closet taunting me. So I decided to do something about that. Kathleen Clemons is one of the photographers that is well known for her skill with a Lensbaby. Her soft, impressionistic images are just exquisite. She teaches a 4 week online class covering the basics of Lensbaby photography. We’re in our third week now, and while I understand now what I was doing wrong before there is still a bit of a learning curve. This is where I feel like a total rookie again. My images (mostly) don’t have good sharp focus where they should, the lens is much wider in scope (50mm) than I normally use. and more. I’m getting there but I just generally feel like a beginner again. So here’s to risk, innovation, bravery, and being a rookie! This entry was posted in Filling the Well, Stretching and tagged Creativity, Fall, Play on September 28, 2016 by gail.